The Chart of the Day belongs to Morningstar (MORN). I found the investment research stock by using Barchart to sort today's All Time Highlist first by the number of new highs in the last month, Then again for the best technical buy signals. Next I used the Flipchart feature to review the charts. 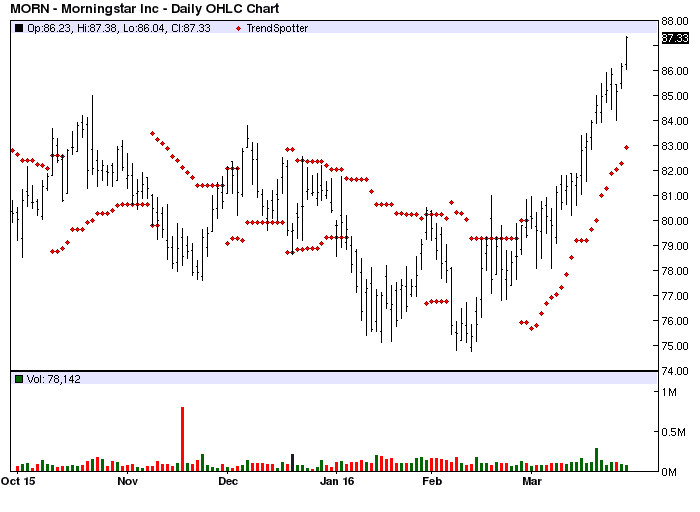 Since the Trend Spotter signaled a buy in 2/26 the stock gained 9.15%. Morningstar, Inc. is a leading provider of investment research in the United States and in major international markets. The company offers an extensive line of Internet, software, and print-based products and services for individuals, financial advisors, and institutional clients.